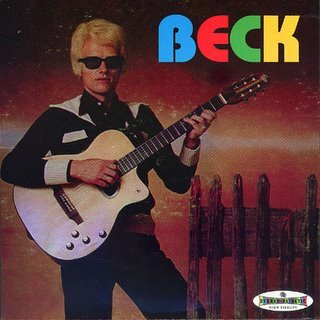 Available on The History Of Beck: A Selection Of His Non-DGC Work and 1 other release. You could see it so clear! Oh he really threw up! He threw up all over the place! He really threw it! He got really sick! "Steve Threw Up" is probably the closest thing Beck has ever come to having a pure novelty song. Of course, it was liked enough to be released as a single, and somehow there is something slightly charming about it, despite the topic. But it did get a fair amount of play on Dr. Demento's radio show in 1994 and 1995. Fortunately, however, Beck never became the "Steve Threw Up" Guy. Apparently, this is a true story. It is about Steve Moramarco, a friend of Beck's back in the day, a fellow Los Angeles musician. Most notably for us, he was in Bean, the band Beck shared a single with on his first ever single release (MTV Makes Me Want To Smoke Crack). There are two versions of "Steve Threw Up": the released single version in 1994, and a version he recorded for Golden Feelings. The latter was not included on Golden Feelings, but it was made available in 2001 with a collection of outtakes from that album. Interestingly, this outtake had already been "released" in a way, on the tape Beck made for his mother, Fresh Meat and Old Slabs. The outtake release is of better, clearer quality (of course), as the version known to most on Fresh Meat has been dubbed from tape to tape to tape to tape for many a year. The single version is a much more accomplished version, of course. The earlier outtake is pretty much done in a folk arrangement, and Beck shouts the lyrics. He actually sings a bit, and has that dog backing him, on the single. Petra Haden plays violin, and she and Anna Waronker sing back-up vocals. I'm not sure what they're saying exactly; it sounds like "Steeeve tossed it." Also Steve's throw-up has a great deal more food in it, as Beck goes into excruciating detail. Beck, I would guess, played this a bit in his early '90s, pre-Mellow Gold days. But since then, he seems to have actively avoided it (people in the audience used to like to request it often). In summer 2002, Beck did a solo tour, improvising setlists and taking requests. A few times he responded to audience requests for the song, and talked about how his old goofy folk stuff ("Satan Gave Me A Taco," "MTV Makes Me Want To Smoke Crack" etc.) were better left in the past. A few times, he attempted brief medleys of the songs, or sang a line or two of "Steve" as he talked. Never a full cover.